I’m a member of a cooking group on Facebook called “Cooking From The New Midwestern Table” by Amy Thielen. Our goal as a group is to cook our way through Amy’s entire book. Each month two recipes are chosen by our fearless leader, Jenny and we all virtually *cook together* and post the photos, an occasional recipe, and our experiences and thoughts about each recipe we made. With cookbook in hand, I set out to make Amy’s recipe for “Best-Ever Beer Cheese Soup” which can be found on page 85 of her cookbook (available at Amazon). As you can see by the title of my post, I added bratwurst to Amy’s original recipe in order to keep the men in my family happy and satisfied. Nice of me, right? I also tweaked, added, subtracted and adapted many more elements to the original recipe, but the backbone of Amy’s recipe is still intact and utterly delicious!!! -Once cooled cut the bratwurst into bite sized pieces and set aside. -In the same Dutch oven that you cooked the bratwurst, and over medium heat, add the butter and olive oil to the bratwurst drippings. -Once the butter has melted, add in the carrots, celery, fire roasted jalapenos, salt and pepper. Cook for about 5 minutes for the veggies to soften. -Stir in the all purpose flour and cook for at least 1 minute to cook out the raw flour taste. -Stir the chicken stock, beef stock, beer and chopped bratwurst in with the veggies. As the soup heats it will begin to thicken slightly (about 5-7 minutes). -Switch to a whisk and reduce the heat to low. -Whisk in the half-and-half, cheddar cheese, Worcestershire sauce, nutmeg and Dijon mustard. Whisk occasionally to make sure all the cheese has melted and that it thoroughly blended. -Reduce the heat to low and allow the soup to simmer for about 5 minutes. -Ladle soup into bowls or mugs and serve. 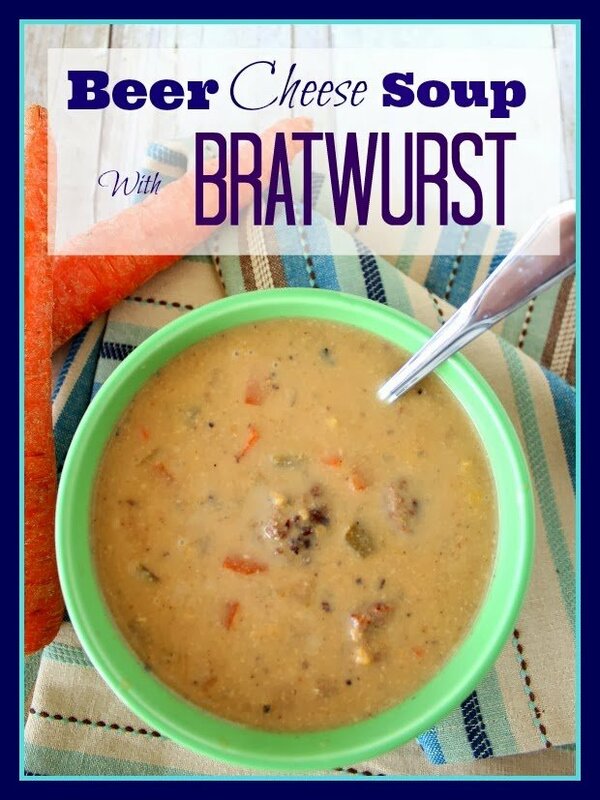 This soup has got a marvelous flavor that is not too heavy on the cheese or beer. It’s a wonderful blend that will pleasure your palate and yet not overwhelm with any one particular flavor. I know you’ll just love it. Served along with a nice loaf of crusty bread and a tall cold brew and you’ve got a weeknight or weekend dinner that will please you to no end. 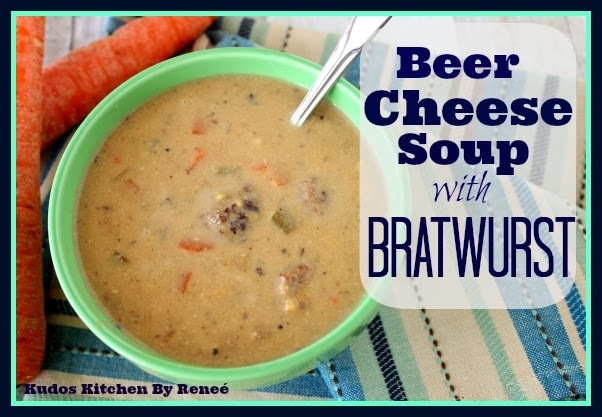 Speaking of beer…and cheese…and the Midwest ~ Four cheers to Beer Cheese Soup! 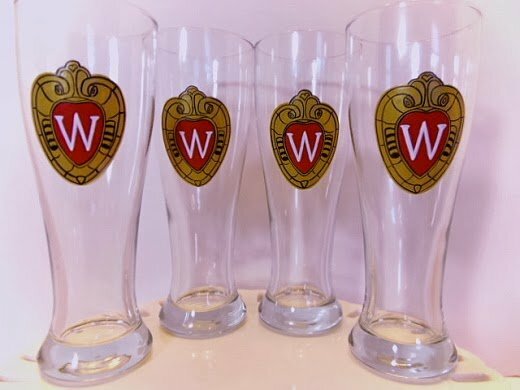 Hand painted custom glassware items you won’t find anywhere else. Please don’t hesitate to contact me or visit my shop (located in the navigation bar) if there is ever anything I can paint for you! If you’d like become a member of the “Cooking From The New Midwestern Table By Amy Thielen” cooking group, we’d love for you to join us. To purchase your own copy of Amy’s deliciously wonderful cookbook, you can purchase it HERE and start cooking with us right away. The soup looks great and love the bratwurst in it. I am a fan of your painted glasses and tiles. I put a little twist on it. I took the casing off the bratwurst and cooked it up making it more like ground beef. Then I took an immersion blender to break up the veggies after simmering for a while and then added the bratwurst back in after. The beer I used was a UK style IPA, which perhaps was a bit sweet for this recipe, but it still turned out great. That sounds great. Good for you for making the recipe your own! !